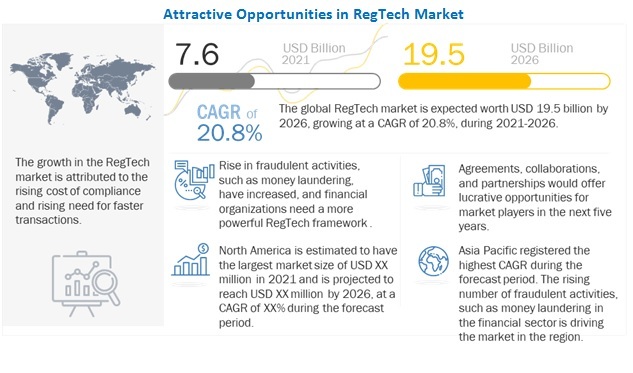 [180 Pages Report] The RegTech market size is expected to grow from USD 4.3 billion in 2018 to USD 12.3 billion by 2023, at a Compound Annual Growth Rate (CAGR) of 23.5%. The major drivers for the growth of the RegTech market are the increased cost of compliance, adoption of regulatory sandbox approach, and low entry barriers for Software-as-a-Service (SaaS)-based offerings. Regulatory Intelligence Application is expected to grow at the highest CAGR during the forecast period. The regulatory intelligence application is expected to grow at the highest CAGR during the forecast period, owing to the much-needed functionality of identifying and interpreting regulatory changes which enables financial institutions to easily manage the changing regulatory environment and minimize the risk of non-compliance. Additionally, the analytics provide financial institutions with insights which can lead to better informed decisions regarding regulatory adherence. Large enterprises segment is expected to hold the largest market share during the forecast period. The large enterprises segment is expected to hold the largest market share, as most publicly traded companies are compelled to adopt regulatory programs. Additionally, as rules and regulations keep altering as per industry and region, keeping a check on all the processes manually does not remain feasible, which further emphasizes on the importance of RegTech solutions and services. Service and consulting vendors such as Deloitte, IBM, PwC, and Thomson Reuters assist large enterprises to realize benefits of efficiently managing their business functions in accordance to the compliance mandates by enabling them to effectively implement RegTech solutions as per their business requirements. As per the geographic analysis, North America is expected to account for the largest market share during the forecast period. This is due to the early adoption of RegTech solutions by the North American financial institutions to reduce compliance cost by leveraging advanced technologies such as Artificial Intelligence (AI), Machine Learning (ML), blockchain, big data, and cloud computing. North America constitutes of developed economies, such as the US and Canada. These countries are significantly advanced in terms of technology and its application deployments. Moreover, stringent regulations and the need to comply with them are expected to drive the market growth in North America. The major factor expected to hinder the market growth is the regulatory divergence, which is restricting the deployment of a standard RegTech solution across any jurisdiction. Key market players profiled in this report include Abside Smart Financial Technologies (Spain), Accuity (US), ACTICO (Germany), Alto Advisory (Luxembourg), Broadridge (US), Compendor (Germany), Compliance Solutions Strategies (CSS) (US), Deloitte (US), EastNets (UAE), Fenergo (Ireland), IBM (US), Infrasoft Technologies (India), Jumio (US), Lombard Risk (UK), London Stock Exchange Group (LSEG) (UK), MetricStream (US), Nasdaq BWise (Netherlands), NICE Actimize (US), PwC (UK), RIMES Technologies (US), SAI Global (Australia), Sysnet Global Solutions (Ireland), Thomson Reuters (Canada), Trulioo (Canada), and Wolters Kluwer (Netherlands). These players offer various RegTech solutions to cater to the demands and needs of the market. The major growth strategies adopted by these players are partnerships, collaborations and agreements, and new product launches/product enhancements. In October 2018, Thomson Reuters signed a definitive agreement to acquire Integration Point, an international leader in Global Trade Management (GTM) operations. In June 2017, IBM developed a new Watson-powered RegTech software to help financial services firms manage their growing compliance responsibilities. The new software is developed to help advisors and financial professionals better understand their regulatory requirements, identify potential financial crimes, and manage financial risks. In April 2017, Wolters Kluwer acquired Tagetik, a provider of corporate performance management solutions. The acquisition was done to create a new business unit named Corporate Performance Solutions. What are the opportunities in the RegTech market? What is the competitive landscape in the market? What are the regulations that will impact the market? How has RegTech evolved from the tradition risk and compliance solutions? What are the dynamics of the market? *Details on Business Overview, Solutions Offered, Recent Developments, SWOT Analysis, MnM View Might Not Be Captured in Case of Unlisted Companies. The study involved four major activities to estimate the current market size for RegTech. Exhaustive secondary research was done to collect information on the RegTech market. The next step was to validate these findings, assumptions, and sizing with industry experts across the value chain using primary research. Both top-down and bottom-up approaches were employed to estimate the complete market size. 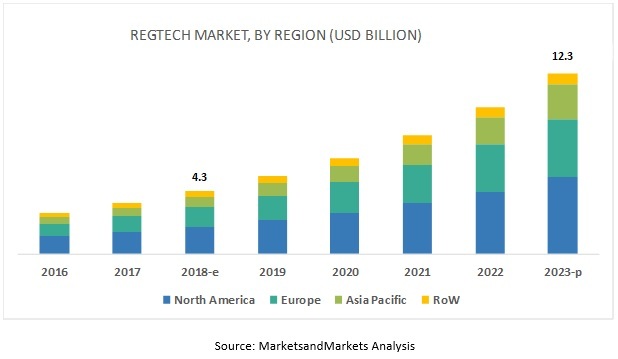 Thereafter, market breakdown and data triangulation procedures were used to estimate the size of the segments and subsegments of the RegTech market. In the secondary research process, various secondary sources, such as Hoovers, Bloomberg BusinessWeek, and Dun & Bradstreet have been referred to identify and collect information for this study. These secondary sources included annual reports, press releases and investor presentations of companies, whitepapers, certified publications and articles by recognized authors, gold standard and silver standard websites, regulatory bodies, trade directories, and databases. Key players in the market have been identified through extensive secondary research. After arriving at the overall market size using the market size estimation processes as explained above, the market was split into several segments and subsegments. To complete the overall market engineering process and arrive at the exact statistics of each market segment and subsegment, data triangulation and market breakdown procedures were employed, wherever applicable. The data was triangulated by studying various factors and trends from both, the demand and supply sides.